Rare it is when a band forms, blows the doors off with their music, falls apart, regroups – and hits new highs. 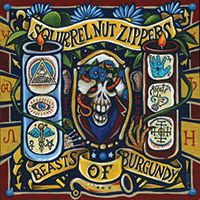 In fact, this first new album from the Squirrel Nut Zippers in 18 long years just may be one of their best. Like their landmark 1996 album Hot, this is a kaleidoscopic whirl through jazz, folk, blues, country, even punk. Thus, the disc heralds a return to form, but also an even more creative adventure, thanks to its wild thematic journey. With guitarman Jimbo Mathus at the helm, this is a ride through old-time carnival sideshows, Storyville haunts, and the beasts of Nawlins’ Burgundy Street. It kicks off with a partial rendering of the phenomenal 1919 “vod’vil” obscurity “Oh! How She Dances!” in an overzealous barker’s chant before moving into “Karnival Joe (From Kokomo).” This rowdy, razzmatazz spirit powers all 12 tracks. At times the sheer joy of the big band overwhelms the limits of the recording technology and the sound becomes muddy yet always enthused and inspired; think vintage Satchmo at his best. Mathus’ guitar rings out, while the fiddle and banjo of Dr. Sick and enthusiastic horn section roar.